I want to introduce you all to a friend of mine here in Austin named Brian Boitmann. He is the founder and “chief sharer” of “Acts of Sharing“, an online sharing tool to help you and your friends reduce waste and save money! (There’s a LOT more to it than that, so I encourage you to visit www.actsofsharing.com to learn more !) Brian lives here in Austin, and is a UT graduate with big dreams for the Kingdom. We sat at a coffee shop while he shared the vision for AOS with me. He has dreams of seeing people all over the country and world collaborating to share their possessions with one another in an effort to model Biblical principles – after all “there’s enough for everyone’s need, but not for everyone’s greed”! Basically, you create a profile at AOS, build a collection of the things you own, begin lending them to friends you trust/those in your “circles”/community, and borrowing things you may also need. This might be DVD’s or books that sit on your shelf, a lawnmower that your neighbor needs while he waits for his to get fixed, or for all of us parents out there – BABY stuff that sits in your attic because your kids have gotten older! Something like AOS would work perfectly among faith communities, missional communities, and simple churches! One of my favorite functions of the site is that it shows how much $$$ you have saved yourself, as well as money your friends have saved by borrowing things instead of going out to purchase them. After all, why should the same book be on the shelf of you, and several/all of your friends!? A great example of this is when we lived in Las Vegas. Morgan and I were getting ready to go backpacking with some friends to the beautiful Havasupai Indian Village. We started buying gear from REI when we realized that a neighbor already owned several items we needed. So, he let us borrow his sleeping bags and pads. A little while later he was going backpacking and was able to use some of the gear we had purchased! It saved each of us hundreds of dollars! I just wish we had AOS when we lived in Vegas! Who knows how much $$$ we would have saved ourselves and others!? AOS was launched in Austin, as well as DFW, and possibly some others. Contact Brian today if you think something like this would benefit you and your city! Scott will also greatly appreciate your feedback. To the right of this post, and down a little bit you will notice a “box.net” file sharing widget. The file is at the very top. Simple download it, fill it out, keep it, share it, and please email it back to me. I will forward it to Scott. Again, your response is greatly needed and appreciated for this “study”. Let me know if you have any questions! 1 Year Anniversary & REALationships. Morgan and I spent last weekend with two of our close friends who live in Ocean Springs, Mississippi. They got married in June, and moved from Dallas to Ocean Springs to help start an Acts 29 church called “Mosaic”. The Lord did something beautiful in each of us over the weekend as we poured into one another, and watched as the Lord grew us closer to each other and Himself. We experienced beautiful community together as we cooked meals, planted a garden, prayed, rested, sharpened, and spoke wisdom into each others lives about marriage and serving Christ with our all. We planted a garden with the Taylor’s at their new home! Fully equipped with Basil, Cilantro, Parsley, and Flowers! We drove an hour west to New Orleans and spent some time there. We all prepared a 5 course meal together, and spent the entire evening eating and drinking to the Glory of God. Beautiful. Monday, October 20th was mine and Morgan’s 1 year anniversary. After spending the weekend with the Taylor’s they dropped us off in New Orleans at a Hostel. It was RAD. We all have a lot to learn from “hostel life”. Above: India House Hostel – New Orleans, LA. 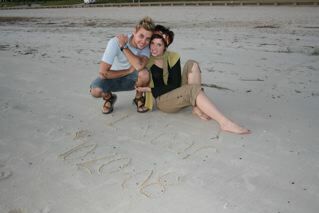 Above: On the beach on Ocean Springs…Morgan wrote our wedding date in the sand! We spent the day touring New Orleans on our anniversary. This was a beautiful time of rest for both of us. We had a great time, and enjoyed one another as we celebrated our first wonderful year of being married. Thank you Jesus. I am a people pleaser. Some might accuse me of loving attention, and being in the center of it. As a young man in the midst of “ministry”, “church planting”, or whatever you want to call it I am haunted by what the world deems as effective ministry. (Most define effectiveness by the numbers of people we are able to draw to ourselves, and into our weekly events). I have chosen to pursue the narrow path, though difficult, and seemingly impossible. By no means do I have it figured out, and will spend the rest of my life seeking to stay on this path. This is the path that seeks to pour into a few others at a very deep level. Loren Cunningham, in one of his books, breaks down what it would look like if each Christ follower spent three years pouring into 11 people, sending them out, and then starting over again. By the end of the 13th three-year cycle the entire world is reached with the Gospel of Jesus. The problem with this is that no individual could receive credit for a movement of God like the one described above. Only God could be traced back, and given credit for such a thing happening. I often wonder if any human will ever live in such a way that does not expect credit, or glory for things they think they have done, but insists that God be glorified. I am convinced that man’s expectations for numerical growth have crippled the growth of the kingdom of God. I know far too many burned out “church planters” who sought to plant a church, but could not meet the high expectations of the “mother church”, or other supporters. On the other hand, I know far too many “church planters” who have “succeeded” in the numerical growth of a “congregation”, therefore, meeting man’s expectations for success, but generally speaking, have failed to raise up true disciples. Of course, the “success” puffs up, and leads to pride. God is soon squeezed out of the picture, and little Glory is given to His name. Man’s kingdom is grown, and God’s kingdom is seemingly ignored. The type of success described above usually revolves around a single person who is a type A, driven leader. (Please know that I am not referring to ANY one church in particular for either of these examples. If you are suspicious that I am speaking of YOUR church then you may be seeking the approval of someone besides God, and the mere fact that the word “YOUR” is before the word church should bring conviction from the Holy Spirit). Once again, I feel there is a healthy balance with everything. I do not think large churches that grow fast are bad. I simply feel that when the pursuit of numerical growth at a weekly event takes priority over discipleship we have strayed far from the example Jesus has left us in scripture. Of course, I do not know a single pastor who would actually admit to pursuing numerical growth over discipleship, but a simple glance at a church’s budget, and how much energy is put into weekly services is a simple way to reveal the truth. A new metric for success: One challenge I frequently submit to myself, and others who seek the narrow path is this: “If you were to, hypothetically, remove the weekly service from the picture, what would be left? Clearly, if there is not a large ‘chunk of meat’ remaining (Home teams/small groups, local/global investment, outward focus, and other things that should function outside of a weekly event) then there is a problem. The scary thing is that so many of us fall into the trap of what man tells us is “effective ministry”. I have, and continue to struggle with this daily. Though we say with our words, in theory, and on paper that we hold discipleship, accountability, seeking the welfare of our city, intimate relationships, etc. as highly important, our default is to focus on how smoothly run, and attractive our weekly service is. If we can successfully fill a room full of people once a week then we have accomplished success. Our vision begins to get cloudy, and we trick ourselves into thinking that our brilliantly communicated “sermons” are what is primarily needed in the lives of those involved in our churches. Just one example: Barna Group research disturbingly shows that less than 25% of weekly church-goers attend a small group with other believers during the week. The good news is that this percentage has almost doubled since 1994. However, in 14 years we still have less than a quarter of our “congregations” plugged into an environment that allows for intimate, accountable, discipleship relationships. (http://www.barna.org/FlexPage.aspx?Page=Topic&TopicID=45) Scary. We must stop treating people as numbers on our weekly attendance records, and start focusing on individuals. In order to do this we must drastically change the way we do things. We simply cannot continue doing the same things over and over expecting different results. One practical way to do this is to allocate more time, energy, efforts, and resources on things other than our weekly gatherings. I wonder what would happen if we shifted our view of “church” off of a weekly large group gathering, and onto developing intimate relationships with other believers in order to be Jesus in our neighborhoods, jobs, schools, lives, etc.? Have our church buildings, and services become our idols? Have we accidentally allowed them to replace the pursuit of deep, Biblical community with others?